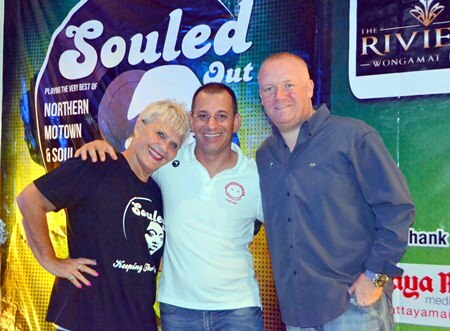 The sounds of Northern Soul & Tamla Motown were blasting out of the Access Inn on the night of Saturday July 5 as the Pattaya Soul Club held another of its quarterly ‘Souled Out’ evenings. 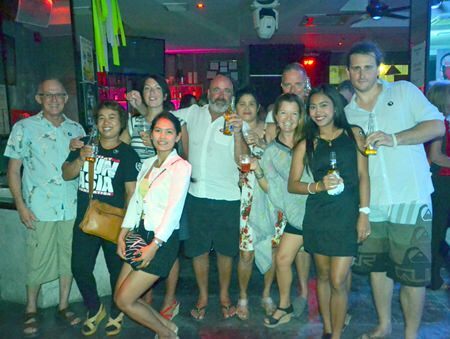 At only 400 baht entrance fee, which includes a variety of Deejays, free-flow beer, red & white wine, punch and soft drinks, this offers incredible value and because of the loyal support of the sponsors it means more of the income can go to charity. Pattaya Soul Club founders, Eva Johnson (left) and Earl Brown (right) pose with Juergen Lusardi of the Take Care Kids foundation. 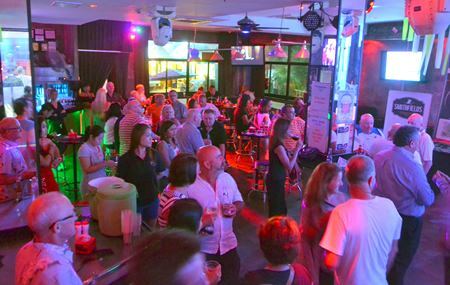 Pattaya Soul Club, which was formed in November 2011 by Eva Johnson and Earl Brown, has provided a great alternative evening out in Pattaya and if you were brought up near Wigan Casino in England you would know that it’s all about the music and shaking your stuff. However the term Souled Out refers to widening the net to showcase other forms of music such as soul and Motown. The sponsors for this latest event were CEA Project Logistics, Riviera Condominium, CES, Thomas Heal, San Miguel, Apple Honey Cider Company, Access Inn and Smithsfields gourmet foods. Revellers all set for another great night of music and fun. Pattaya Soul Club has assisted many needy causes since its inception, including the Mercy Center, the Sanuk Nursery (part of the Melissa Cosgrove Children’s Foundation), the Hand to Hand Foundation and for this event and the previous one they helped an organization run by a few Italians in Pattaya called Take Care Kids. This charity helps mothers to continue to work here in Pattaya and looks after their children, rather than the kids being sent up-country to be raised my other family members. You can find out more about Take Care Kids on their website: www. takecarekids.org. At press time, Eva Johnson confirmed that this month’s event would allow the Pattaya Soul Club to present the Take Care Kids foundation with a cheque for 45,800 baht. Pattaya Soul Club will return in about 3 month’s time for its 3rd birthday party, presenting another night of Souled Out music. To keep updated with the activities of the club, check out its popular facebook page: www. facebook.com/PattayaSoulClub. Tripping the light fantastic on Souled Out night. With a free-flow of alcohol and soft drinks there was something for everyone. Starting out young –budding soul fans hit the dance floor. 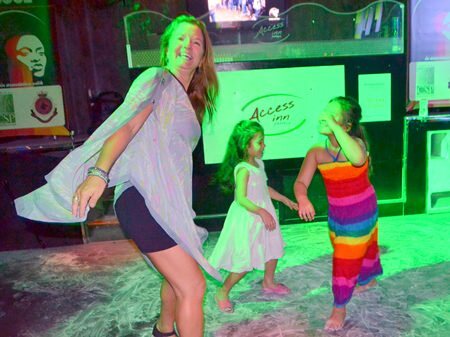 The Access Inn on Pattaya Third Road was throbbing to the sounds of yesteryear.